Not since Mario Monti took on General Electric’s Jack Welch and Microsoft’s Bill Gates has an EU antitrust enforcer taken such an aggressive tone with companies operating in the EU marketplace. It’s certainly a more direct, even transparent way of proceeding that her predecessor, Spanish commissioner Joaquín Almunia, who preferred negotiating closed-door settlements — a tactic that did not work, so far, with Google. In a throwback to the Monti days, Vestager last week threatened to block GE’s bid to acquire the French energy business Alstom without further modifications to the proposed merger — and that’s after the French government last year stepped in to demand a better deal. 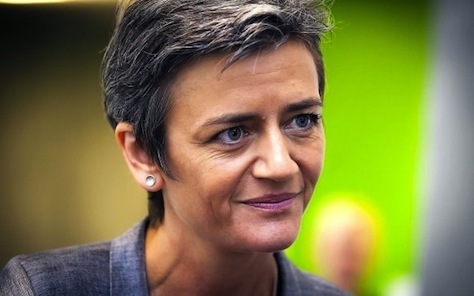 As many profiles, especially in the US media, have noted since April, when Vestager pursued the charges against Google and Gazprom, she’s a tough-minded technocrat who, time after time, has demonstrated that she would rather be correct than be popular. She led her party, the centrist Radikale Venstre (Danish Social Liberal Party) to its best-ever result in the 2011 election with 9.5% of the vote. Profiles often paint her as an obscure figure in Danish politics. But as deputy prime minister and economic and interior minister, many Danish voters came to regard Vestager as more influential than Thorning-Schmidt in the first three years of the broad center-left coalition government. Vestager’s policies as economics minister included budget-tightening reforms that reduced early retirement benefits and kept Denmark on course to raise its retirement age. It’s tempting to argue that her less charismatic, less familiar successor, Morten Østergaard, is to blame for the party’s woes heading into the June 18 elections — it’s polling around just 5%, down from when Vestager left the leadership, after seven years, to take the Commission job. But the Social Liberals wouldn’t be the first junior coalition partner to find that European voters are unkind to the smaller parties that make the compromises to prop up larger parties — note the near-extinction of Germany’s Freie Demokratische Partei (FDP, Free Democratic Party) in the September 2013 elections and the horrific results for the Liberal Democrats in the United Kingdom last month, even as chancellor Angela Merkel and prime minister David Cameron won even larger respective majorities. None of that should necessarily trouble Vestager, though it may mean that Thorning-Schmidt, whose own party, the center-left Socialdemokraterne (Social Democrats), will be unable to cobble together a majority of 90 legislators in the Folketing, the Danish parliament. Vestager, who began her political life as a Social Liberal party official at the age of 21, served as education minister in the final term of the left-leaning government of prime minister Poul Nyrup Rasmussen between 1998 and 2001. After taking over the Social Liberal leadership in 2007, her party suffered a setback in 2008 before roaring back in coalition with the Social Democrats in 2011. A setback in the 2015 election won’t necessarily take the shine off Vestager’s rising star at home, where Danes seem mostly proud of her star role at the European Commission. Moreover, there’s certainly no shortage of precedents for former European Commissioners returning victoriously to national politics. Monti, after his stint in the Commission’s competition brief, ultimately became Italy’s prime minister. At the age of 47, Vestager could easily stay in Brussels until 2014 or even 2019 and return to Danish politics in the one role that’s eluded Vestager — prime minister. The last (and only) Social Liberal to hold the role since 1920 was Hilmar Baunsgaard, who headed a three-way coalition from 1968 to 1971 that included two center-right parties. Vestager, who came to the Social Liberal leadership after promising to steer the party to a more equidistant path between the left and the right, might one day follow Baunsgaard’s path. Danes already refer to her as ‘Margrethe III,’ in reference to the country’s sitting queen, and the producer of the popular television show Borgen, a drama about Danish politics, has hinted that the character of Birgitte Nyborg is based not on Thorning-Schmidt, but on Vestager, who currently has 108,000 followers on Twitter. Opposition leader Lars Løkke Rasmussen, head of the center-right Venestre (Liberals), has less than 39,000; Thorning-Schmidt doesn’t even have a Twitter presence. Though Danes may await Vestager’s return to national politics in the 2019 election or beyond, she’ll first have to prove that her aggressive approach to competition law will bear real results for customers without scaring off (too much) the behemoth businesses and governments that her office is investigating.